The wolf and wild cat ancestors of our canine and feline companions hunted or ate carrion, which required them to tear the food source with their teeth and jaws into swallowable pieces. This chewing and tearing activity generates a natural cleansing action on the surface of the teeth, which may not occur when foods that do not require effective chewing are given to our pets. The result of lack of normal tooth cleansing activity is accumulation of soft dental plaque and then hard dental tartar on the surface of the teeth. These coatings are the cause of gum disease (periodontal disease), which is the most common clinical abnormality seen in both dogs and cats. Figure 1 (see below) shows healthy teeth and gums in a dog. Soft dental plaque forms on teeth within 24 hours; it largely consists of bacteria that grow by feeding on the nutrients that pass through the mouth. As the plaque thickens, there is less oxygen available in the deeper areas, and bacteria that do not require oxygen thrive; these ‘anaerobic’ bacteria irritate the gum tissues, and inflammation results, which, if allowed to continue, causes bleeding of the gums and eventually loosening of the teeth in the bone, accompanied by pain. It has been shown that microscopic pathological changes in distant organs (kidneys, heart and liver) are more prevalent in dogs with severe periodontal disease, probably due to the release of bacteria into the blood stream during chewing activity on inflamed gingival tissues. Every day, calcium salts in the saliva and food are deposited on the surface of the teeth. It typically takes 2-3 days to form the hard layer known as tartar in detectable amounts (figure 2). Until then, plaque can easily be removed from the surface of the teeth by abrasion, such as chewing or brushing. Once tartar has formed, it is much more difficult to remove; thick tartar deposits (figure 3) require professional tooth scaling. Accumulated tartar provides a rough surface that protects dental plaque, which leads to severe gum disease. There are two important aspects to gum disease that pet owners should be aware of. One is prevention, and the other is treatment once the condition has become established. Periodontal disease is very easily prevented – remove plaque daily to prevent it maturing, and prevent deposition of tartar; this requires ongoing daily activity. Chewing materials that have a combination of an abrasive surface and stringy pieces (that act like dental floss when chewed), such as in the natural diets of carnivores, are effective. Some owners feed a ‘raw meaty diet’ to their pet, though most find it esthetically unacceptable to have chunks of raw meat on their kitchen floor. 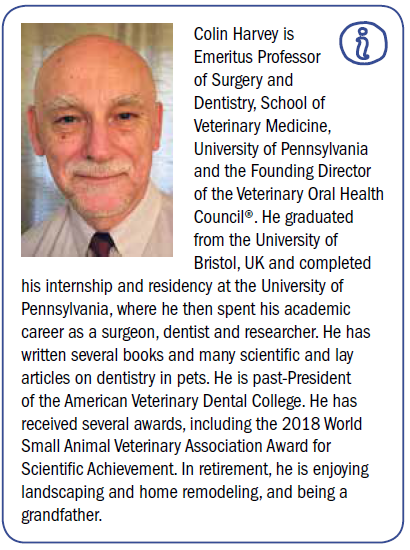 The result is that most pet dogs and cats are fed a commercially produced canine or feline diet that is nutritionally complete, esthetically acceptable and has a long shelf-life, but which may predispose to development of periodontal disease in the absence of effective daily oral hygiene. Brushing the teeth with a tooth brush, just as we do, is the ‘gold standard’ for oral hygiene (figure 4). Most dogs will allow their teeth to be brushed by the owner if the owner is patient. Start by holding a soft-bristle brush coated with a little highly palatable material, such as ketchup or mayonnaise, while gently holding the head of the dog as it licks and chews on the brush. After a few times to acclimate the dog to the feel of the brush, start to move the brush in a small circular motion. When the dog is cooperating, start to move the brush over the full external surfaces of the teeth on both sides, maintaining the circular motion and with the bristles directed at a 45o angle to the surface of the teeth. Fortunately, plaque forms most readily on the outside (cheek) surfaces of the teeth – the tongue does an effective job of keeping the inside surfaces of the teeth clean, so you do not have to hold the dog’s mouth wide open to reach the inside surfaces of the teeth with the brush. A finger covered by a rough-surfaced face cloth is an alternative if the dog will not accept the brush. Some dogs just won’t cooperate, or it may be difficult for an owner to manipulate the brush or face cloth while holding the dog. Alternatives are using a chemical agent (as a water additive or in a spray or gel that is applied directly onto the oral tissues, or onto the skin of the lip so that the dog licks it off and the tongue coats the teeth) to retard plaque or tartar accumulation, or giving firm (but not hard or inflexible), treats or rawhide chews. Another option is to give a ‘dental diet’ as the daily meal – these full nutrient profile diets are manufactured so as to provide dentally-effective abrasion as they are chewed, or they contain an anti-tartar agent such as a polyphosphate. Many owners are aware of the enjoyment that dogs get from chewing; however, care is needed in selecting items to be chewed. Some dogs love to chew tennis balls, for example; however, the rough surface of the tennis ball acts like sand-paper on the surface of the teeth, wearing the tooth down to the gum line in severe cases! Providing a ‘natural’ chew treat can also be hazardous – bones that have been scraped free of all attached ligaments and tendons, or antlers or cow hooves, seem like a safe and clean option; however, these hard objects can fracture teeth as the dog bites on the hard surface. The same is true of hard nylon chew toys. Materials that are safe and may have a beneficial effect on dental health include pig ears, ingested chew treats and flexible rubber chew toys. Any activity designed to prevent accumulation of plaque and tartar must be applied frequently and life-long to remain effective. WHAT TO DO IF HEAVY ACCUMULATION OF PLAQUE AND TARTAR HAS BEEN ALLOWED TO OCCUR? Professional scaling will remove the tartar, and with it the dental plaque that is causing the disease; this is best done under anesthesia. While anesthesia may sound dangerous, use of modern anesthetics in pets is now much safer than was the case a generation or two ago. During a scaling procedure, the mouth and teeth should be carefully evaluated by a veterinarian because in some patients, additional disease may be present, or additional procedures may be indicated, including in many older, smaller dogs, extraction of sometimes many teeth. Extraction of teeth may sound worrying, but dogs and cats manage very well when they are missing some if not all of their teeth. Teeth cleaning without anesthesia services are now being offered; such services cannot be recommended because, until the mouth is thoroughly examined, it is impossible to know just what is required, and because it is not possible to thoroughly scale the teeth down into the pockets beneath the gums in an awake dog. Because of the insidious way that periodontal disease develops, periodic examination by a veterinarian is recommended – for dogs that develop tartar accumulation rapidly, the dental examination should be repeated at least every six months. Older toy or small dogs are more likely to have severe periodontal disease; they should also be examined frequently. Every time your pet is examined by a veterinarian for any reason, be sure that he or she ‘lifts the lip’ to examine the teeth. Periodontal disease also is very common in cats. Providing daily oral hygiene for cats by brushing is more of a challenge than for dogs. Alternatives are available, including water additive and sprays, or gels that can be applied with a finger, plus chew treats and dental diets. 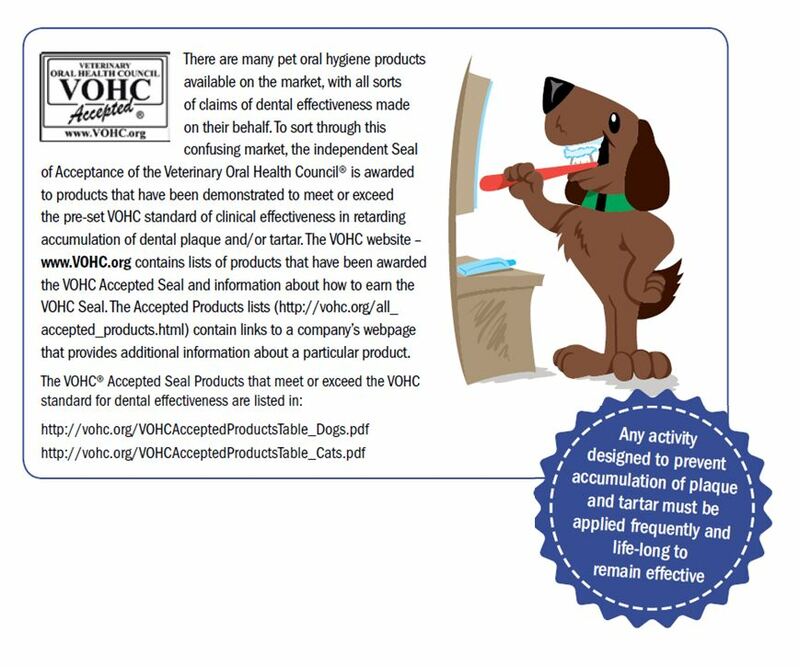 As for dogs, the VOHC® Seal of Acceptance provides confirmation that a product is clinically effective when used as directed. The VOHC Accepted Products List includes products for use in cats (http://vohc.org/VOHCAcceptedProductsTable_Cats.pdf). Maintaining a healthy mouth in a cat presents additional challenges because of the frequency of other painful oral diseases, such stomatitis and tooth resorption. A cat that is not willing to eat, or that is drooling, particularly if there is blood mixed in the saliva, or that is now reluctant to have its mouth felt, should be examined by a veterinarian promptly. 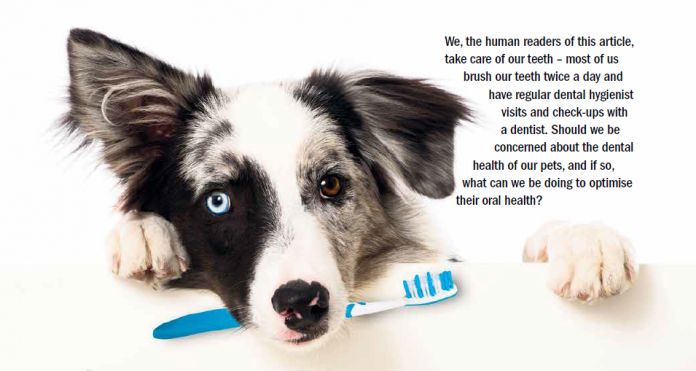 In addition to gum disease, there are many other conditions that impact the oral and dental health of dogs and cats. Our modern-day pet dogs and cats are the result of generations of selective breeding by their owners, which can result in jaws with teeth that do not form a normal occlusal relationship – consider a bulldog or Boston terrier compared with a grey-hound, or a Persian cat compared with a Siamese cat! These abnormally occluding jaws can no longer provide normal chewing action, and thus predispose to more rapid accumulation of dental plaque and tartar. There are many other occlusal abnormalities, such as retention of deciduous (baby) teeth. When the teeth do not occlude normally, the mouth should be examined while the pet is still a puppy or kitten, and additional attention should be given to oral hygiene life-long. Fracture of teeth is common, resulting from biting on hard objects or automobile accidents. The sensitive pulp is likely to be exposed. Root canal treatment and restoration of the crown can be performed to restore function. Unfortunately, cancers can grow in the mouth of dogs and cats, some of which are malignant. Remember to have your veterinarian check the mouth whenever the dog is examined!